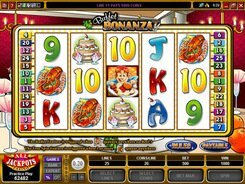 You’d better not play the Buffet Bonanza 5-reel 25-payline video slot on an empty stomach or if you are on a diet, since its symbols will make your mouth water. 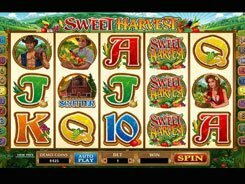 On the reels, you will come across lobsters, cakes, stakes, salad and other gastronomic specialties that pay out decent awards, once a few matching symbols land on the reels. 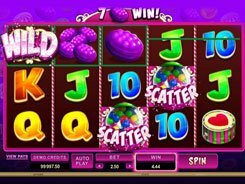 Place a maximum bet of 20 coins per line and set a coin denomination between $0.01 and $0.2. The top stake allowed to be placed per spin makes up $100. 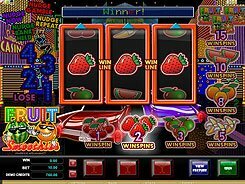 The highest jackpot payout of a massive 6000 coins is awarded for the Meat symbol, provided five of them have landed on any enabled payline. If you stake at max, your prize in money terms will be really immense! A wild symbol is a hungry Diner that can replace other symbols to create winning combinations. If the wild occurs on reel 3, it expands up and/or down across the reel, so the entire middle reel turns wild making your win opportunities even more alluring. The Buffet Bonanza logo represents a scatter. 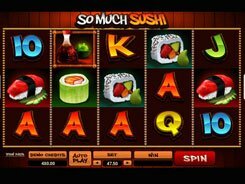 Three or more logos scattered in any position start ten spins with a x2 times multiplier. 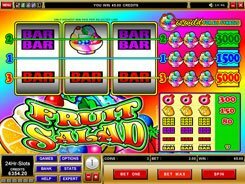 After any winning spin you can try to double or even quadruple your payouts in the Gamble feature by selecting a card color or a card suit. If you guess it right, your winnings will be increased x2 or x4 times. If you guess it wrong, you lose the payout. PLAY FOR REAL MONEY!